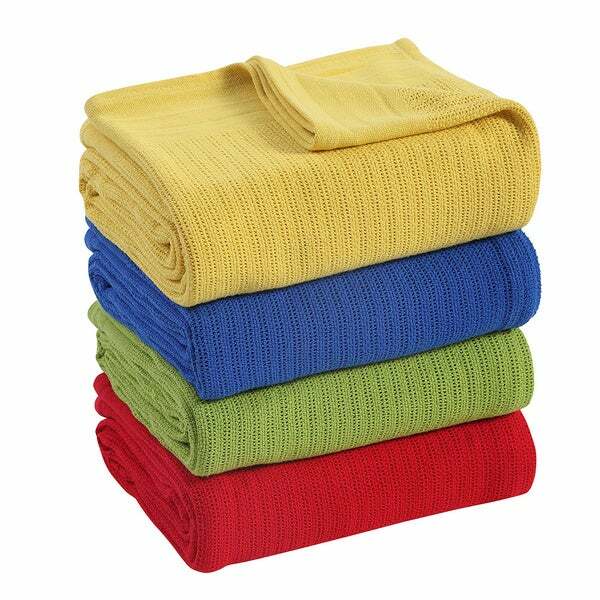 This is a classic blanket you can not be without it. It feels so good next to your body and keeps you warm. I bought several blankets and love them. The price is right. Cuddle up and enjoy toasty warmth with this cotton thermal blanket. Crafted of 100-percent ringspun cotton, the blanket's unique weave provides even air flow to prevent overheating. If covered by a sheet or another blanket, the blanket forms tiny air pockets to trap heat and keep you cozy. The stabilizing weaves along the side ensure lasting shape and comfort through use and washing, and the blanket is available in a variety of colors to match your decor. I ordered two twin size. One in white and the other in lemongrass. Washed them upon arrival. There was barely any lint and no fading. I LOVE how wide and long these blankets are...plenty of room on all sides! Also soft, lightweight, yet warm. I am so pleased I ordered a full/queen in Sunflower! Works so well as a cotton thermal blanket. Cotton is soft and holds body heat effectively. Product seems to be well made and was washed and dried before use, with no problems so far. Chose white as the blanket color and the white was bright and clean throughout the blanket. The color was exactly as pictured. I love this type of thermal blanket because I'm the kind of person who always has this exact type of blanket on my bed year round. The last ones I purchased (actually, I have 4 of them, but they were all red and I recently changed the decor in my bedroom and needed this particular color [teal], have lasted for 10 years and still going strong. And even my cats love them because they love to sleep under the blanket because they can breathe easily and see out the weave! Great buy. Great quality. Fast shipping. Very happy. I purchased because I remembered this type of blanket on the bed when I was in my parents home. When I received this and unpacked, it was so much softer than I remembered and I was so excited the first use. I love this blanket and the grey color is an amazing match for my decor. Super happy with this purchase. After falling in love with the Fiesta sheets I decided to try the Fiesta blanket. So glad I did! I purchased the Lapis color. The color is true to the picture. The blanket is soft, even after washing it numerous times. I plan to purchase more in the future. I purchased the twin size ivory cotton thermal blanket. Great quality, at a bargain price! Really love these! Super bright and happy colors - perfect for what I wanted in my grandsons room—Nautical theme works with any of the available colors- I purchased the blue x’2 for twin bed and the trundle too. Soft and cozy! Great cotton blanket! Beautiful color. We have used these blanket for years. My grandchildren call them the " Holy Blanket". Due to the loose weave of the blanket. They get each a new one every couple years. The girls or working on all the colors. They are both cool and warm. These blankets came to me snagged. The photo led me to believe they were a more solid weave but they are not. Cheaply made and not worth the money. I Love Yellow and this Yellow is Perfect!!! Blanket is just the right weight. Does not cause me to overheat. I've never been disappointed by Overstock before, but I guess that there's a first time for everything. My smaller complaint is that I ordered white, and the packing said white, but the blanket is definitely not white. It's more of a grayish or natural color. My more serious complaint is that the blanket, brand new out of the package, had many snags. I didn't think that these were factory seconds, but given the quality control problems, I guess that they are. So disappointed. Cream and not white. Flimsy and nothing thermal about it. See through threading. Donating to homeless shelter. I was so looking forward to receiving this blanket because I've searched for one in the past and couldn't find King size. I had ordered white but when I opened the package, it looked like a very pale gray. In fact, my first thought was that it looked like a "dirty" white. I wondered if it was a used blanket. I thought if I washed it, it would look white, but it did not. I honestly did not feel like going through the hassle of repackaging the whole thing so decided I would keep it and try bleaching it the next time I wash it. I would feel very grateful if Overstock would send me a new one that is white. I'm sure this won't keep me from buying other products from Overstock but again, I sure would feel better if they sent me another one at no cost and no return on the first one. Thank you. The blanket is very nice and just what I was looking for. Great size for queen bed—not skimpy on the sides. Beautiful lápiz blue color. Soft. Nice small open-weave (fun for little eyes to look through and little fingers to poke through). Light-weight, but warm enough for my hot-natured sleeper in winter. A good purchase. I love that with a sheet it keeps me at that just right temp. But it picks very easily and we have 6 little hands that like to pull at those picks! Not as Vibrant in color as shown online but they serve their purpose!! I love the bright colors and chose the aqua blanket because it matches my quilt and looks so pretty with it. It appears to be a well made blanket, but the weave is looser than I like. I do plan to keep it and think it will probably be a nice summer blanket. Great lightweight cotton blanket. The color is vibrant too. This blanket keeps me warm and comfortable in the cooler months and I love, love, love the green color. Ordered the sage. Color was perfect. Washes well. Nice blanket. Would buy again. I don not use the blanket anymore. My husband thinks it's too heavy. By that he means the weight. Love this bright, soft blanket. Only negative thing is it sheds A LOT! This is the second blanket we have purchased. It is great quality and very soft. Will definitely be purchasing another one of these for our spare bedroom. "Could the "slate" color be characterized more as blue or gray?" "Those of you who have bought this blanket, please describe the Ivory color. I ordered Ivory from BB&B and received the Sunshine Yellow. Package was labeled Ivory but blanket definitely was yellow. Also the Lemon grass - true to color on website? Thanks very much." Since Fiesta Bedding is a licensee of Fiesta Brand Dinnerware, all colors must follow the same color and name as the master brand. The color "ivory" is very yellow in hue when copied in textiles. Lemongrass is a bright lime green.